Voucher based attribution and code distribution is a critical function within general conversion and Ecommerce tracking. Advertisers need a function to distribute voucher codes to their customers via their affiliate channels and provide attribution based on those codes. CAKE leverages the payout rules that already exist for standard conversions, Events and Ecommerce for voucher codes. The Voucher Code Attribution layer determines who gets credit for a particular conversion when there is a conflict. 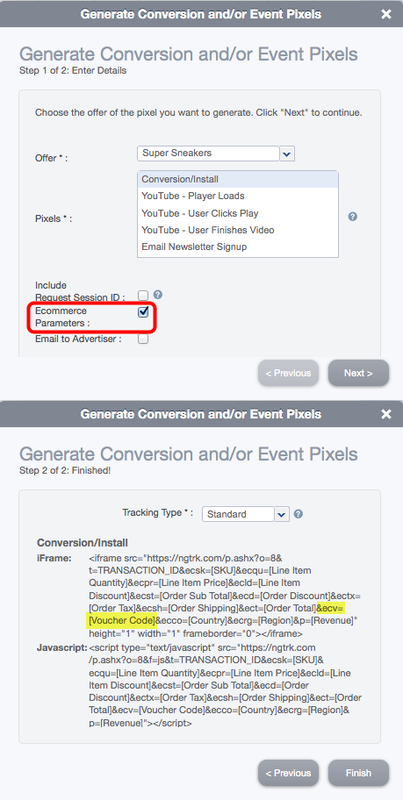 The Voucher Code Attribution setting will determine which source receives attribution when a click and voucher code are present at conversion or event fire. Note, if there is only one attribution element (a click OR voucher) the respective source will win. Payout Voucher Code Holder: When a click and voucher code are present, the voucher source will take the attribution payment. Pay Traffic Source: When a click and voucher code are present, the click source will take attribution payment. No Payment: When a click and voucher code are present, no payment to any source will take place. There is an affiliate-level setting that controls whether or not an affiliate can request a voucher code. 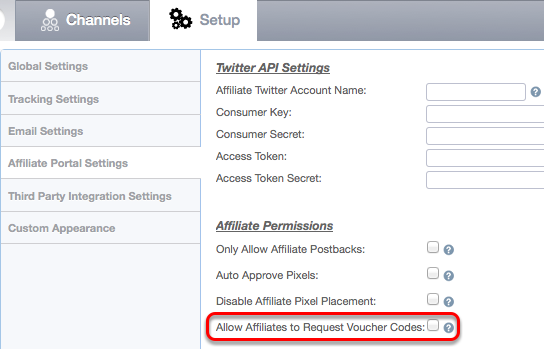 Permissions are set on the Setup>Affiliate Portal Settings>Allow Affiliates to Request Voucher Codes. The Brand Card>Voucher Codes tab allows you to add and import voucher codes at the Brand level by selecting either "Add" or "Import Codes". 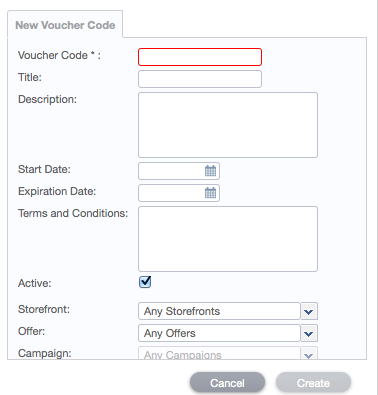 If you select "Add", you will see a blank voucher code row and the display fields that allow you to provide details of the voucher code. Note: When the voucher code expires, the active flag will automatically become unchecked. 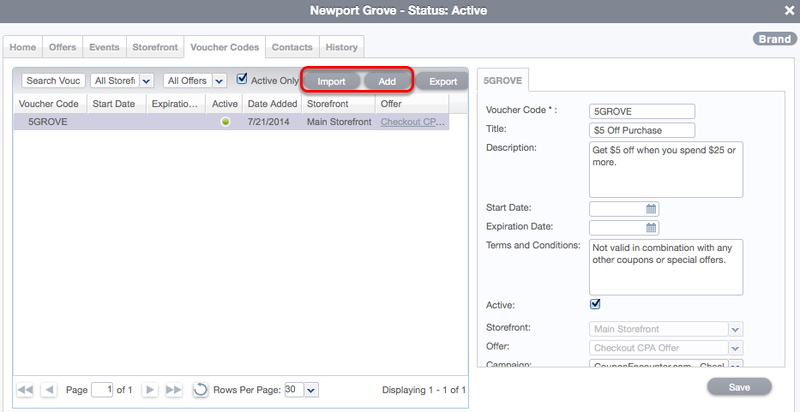 If you select "Import Codes", an import wizard that allows you to load multiple codes at once will appear. Just like the setup for a single voucher code, you can assign the following properties during the (CSV) import process -Sample CSV Format can be found at the end of this document. (promo_code,promo_name,promo_description,start_date,end_date,terms_and_conditions,active). Whether you choose to add an individual voucher code or choose to upload a CSV file with multiple Voucher Codes, you can select which offer the individual or list of voucher codes apply to using a drop-down menu. 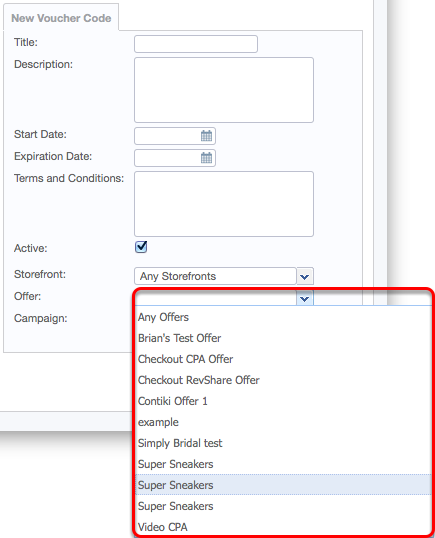 You can also choose to apply an individual voucher code or imported file of voucher codes to “All Offers”. If there are no voucher codes assigned, the voucher code column is hidden. Your affiliate can request a voucher code by clicking the "Request Voucher Code" button. When your Affiliate clicks "Request Voucher Code," they can select from any available creative or request a code for a specific creative. Once the request has been made, the Voucher Code column will display "Pending Approval" until the request is approved or denied by you in the Admin Portal. 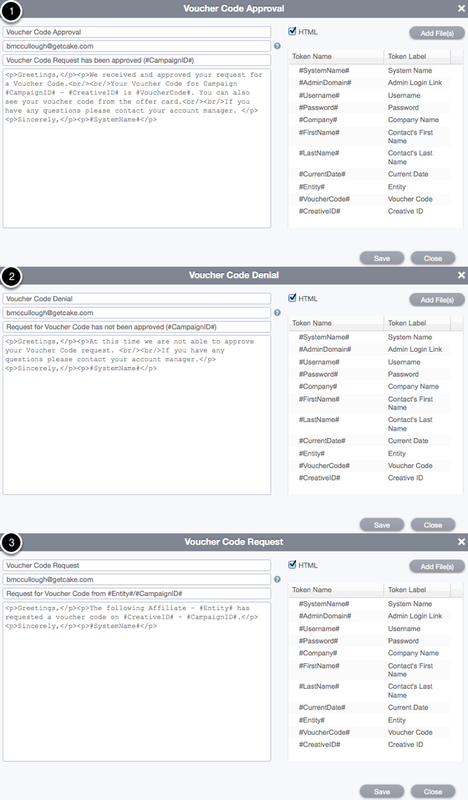 Once approved (see Approving or Denying Requested Voucher Codes below), the Voucher Code column will no longer display "Pending Approval", but will instead display the voucher code itself. If denied, the request line item will be removed as well as the Button to request any additional voucher codes for that Campaign. When a request is made for a voucher code, you will be alerted in the Channels>Pending>Voucher Codes tab. From here, you can approve or deny voucher code requests. When you approve the request by selecting "Assign Code", the first available voucher code tied to the Brand will be used. When you deny the voucher code request for the campaign, the Request Voucher Code button is hidden from the Offer Card in the Affiliate Portal. You can either go line-by-line to approve or deny each voucher code request, or you can select multiple requests and assign or reject them in bulk. Rejection scenarios will remove the request from the queue. However, in scenarios where you approve the code request, a box will appear displaying the Campaign Name (and ID) along with voucher code that has been assigned. When you import and inherit voucher codes at the Brand and Offer level, conversion pixels must be modified to include the ecv parameters. When you check the "Ecommerce Parameters" checkbox in the Pixel wizard, CAKE will populate the conversion pixel with CAKE ecommerce attributes and placeholders. Three email templates support voucher code requests, approvals and denials. Voucher Code Request email template will notify the Admin that an Affiliate has requested a new Voucher Code. Voucher Code Approval email template will notify the Affiliate that they have been approved for the requested Voucher Code. Voucher Code Denial email template will notify the Affiliate that they have been denied a Voucher Code for a specific campaign.